So here it is: My take on the curriculum that I have tried this far. I will share the pros and the cons from my experience using what I have tried. One note before we begin. So much of what works and what doesn’t depends on your personality and the personality/learning styles of your children. If this is you first year of homeschooling, your focus this year is to identify how your child learns best, what his or her strengths and weaknesses are, along with you and how you best steer this ship of learning. Somewhere in the middle you’ll find something that will work. Hopefully this will give you some guidelines. For me, I want things to be simple. I am creative, but I don’t want to have to read a lot of directions and have someone hold my hand through-out the year. I want something flexible, yet provide a good, rich education. My goal? To train my kids to be disciples of Jesus. We do that through education and providing hands-on life experiences to walk them through what that means. I’m not teaching for a test per se, however, life does present us with tests and so I want them to know how to handle that. A few years ago I was praying about school stuff, goals and what to be involved with. I had this dream about a huge boat crawling with people out in the ocean that I was watching from behind the safety of the railing off the shore. All of a sudden it caught fire – a raging inferno. Like a real live scene from Titantic, people were jumping over board, scrambling to float on wooden debris, screams piercing through the air as the ship sank into the water. The thought that came to me is that this world and all that it entails will one day BURN away. And it will be a horrible sight. We MUST teach our kids to SWIM and not just ENJOY the boat ride! We cannot depend on the boat for it will one day go down. And while I wish I could always be here to offer them a lifeboat when times get scary, the reality is, I may not be there at the moment the boat begins to sink. What survival tools do they have to make quick decisions that could save their life? So those are some perspective ideas to keep in mind when you’re making goals and researching curriculum. Will this give my children the tools they need to navigate the waters for themselves and not just pictures to hang on the wall of their room on the boat? With all that said, here’s my pro and con list! 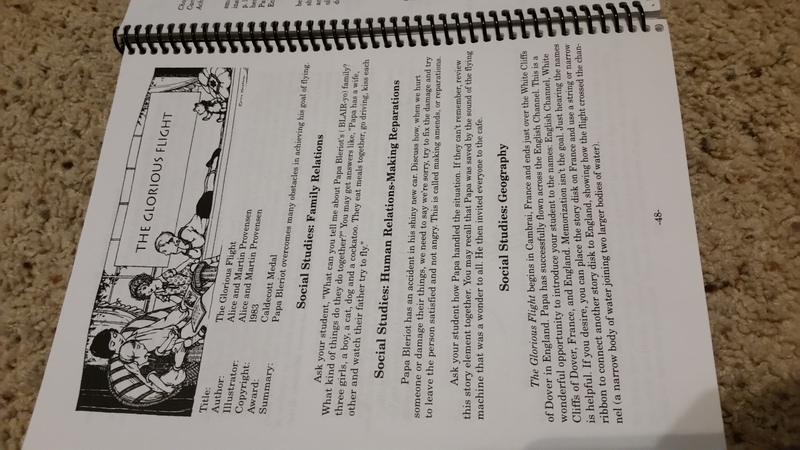 This is the original curriculum we started with as Caleb went to a private school and that is what they used. Abeka is one of the original homeschooling curriculum out there. It’s been around for more than 50 years and offers virtually everything. Pros: It covers all the bases, well. If you ever placed your child back in a school setting, they would be right on track, if not a grade ahead. 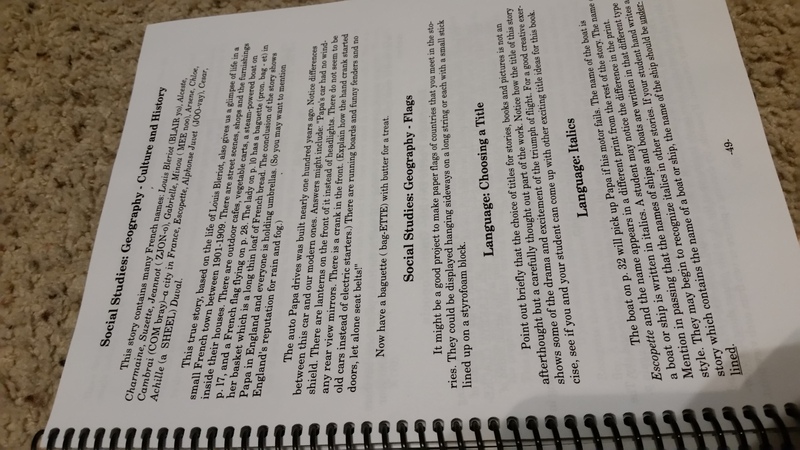 Scripted teacher manual, gives you every direction you would ever need. Abeka offers charts and posters for any subject. The actual curriculum is very repetitive, so students get the material. 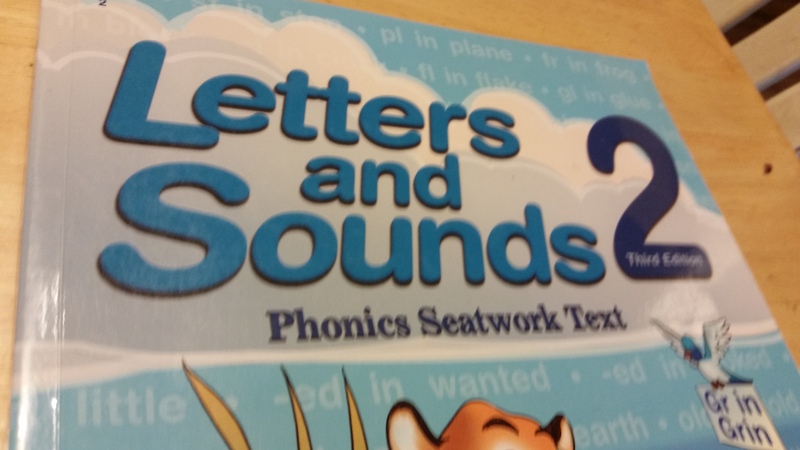 For phonics, they emphasize special sounds and drill them over and over again ensuring students know how to read. 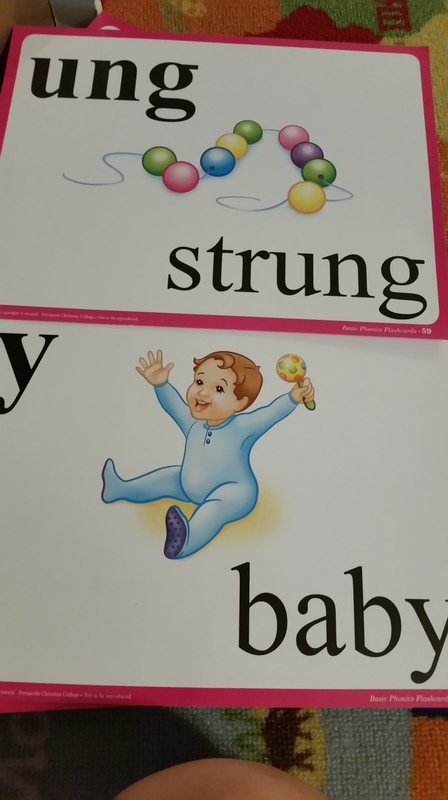 Spelling goes right along with what they learn in phonics, again adding another layer of exposure to the words. For handwriting, they offer cursive in Kindergarten. For math the pages are colorful, new material is taught every few days, with continual repetition of past lessons. Science and history are just readers for the early years. They offer a cut and paste style art book for fun arty projects that coordinate with the seasons. Music and humanities are also offered. They also offer online courses called Abeka Academy. If you are in a position that you’ve brought your child home from public school and are working as well, this looks like a great program. All the lessons can be viewed from a computer and work done at home. Cons: Very school styled. I had a hard time bringing it into my homeschool room. It felt to structured. Always opening up a new workbook. 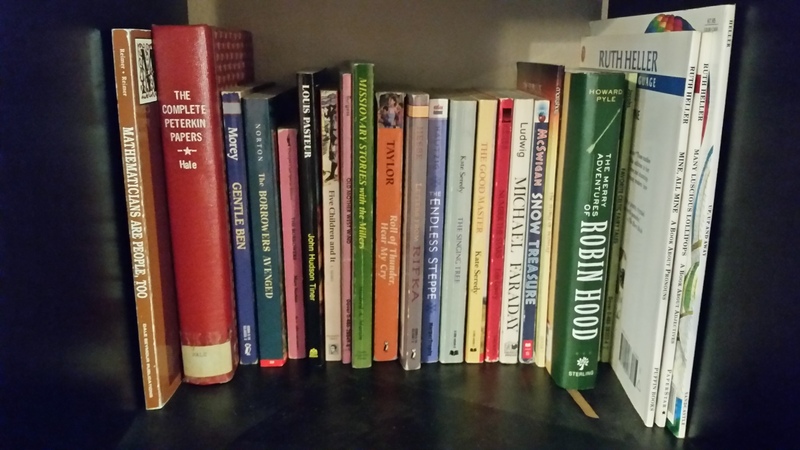 It is not a literature based curriculum, which I learned I prefer. Conclusion: For a schooled approach that would give a classroom style learning, this is the one. Just don’t feel you have to do everything they recommend! This is a literature based program with the idea of reading one book every day for five days. After a book is read, the teacher manual breaks us further discussion into subjects and delve into a different angle of the story. So one day you may use some math and add up how many characters are involved in the story and the next day you may study geography by locating where the story is taking place on a map. Maybe the story line has an order they did certain tasks, so the student will be asked to remember the order. 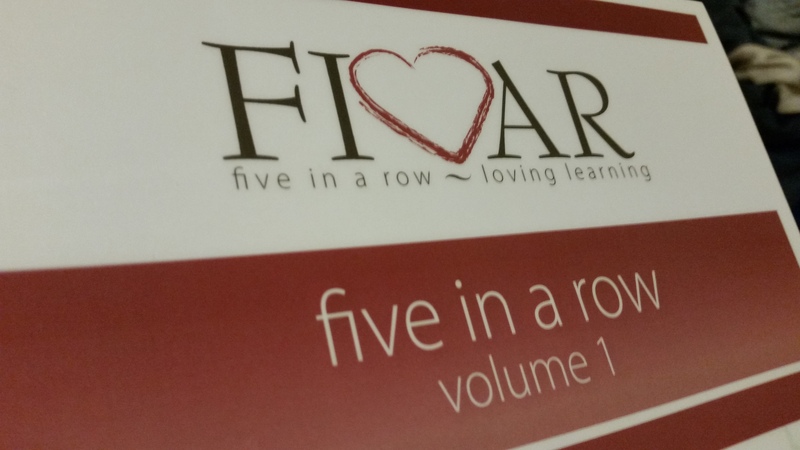 Five in a row brakes down their age categories into 3 groups: ages 2-4, 4-8 & 8-12. All the subjects (Social Studies, Geography, Language Arts, Applied Math, Science and Art) are covered during the week. Pros: For me, I love the literature based learning. I tried this right after I stopped using Abeka and in that since it was a breath of fresh air. The teacher’s manual is very flexible, giving you options and ideas of what to do, but not as scripted as Abeka. I liked their ideas and found another website that gave me a lapboard template to go along with the stories. Cons: I had hoped to find the books at the library to save on cost. They were really hard to find. I recommend if you use this to purchase the books, which then ups the cost. Sometimes my kid’s attention waned after reading the book for the 5th day in a row. “Awe, not that book again…” You would also still need a math curriculum, and there is no phonics/spelling/language arts workbook pages. Recommendation: Good program, buy the books! Konos is the king of unit studies. Founded back in the early ages of homeschooling, it’s been around as long as Abeka. Konos offers a study in every subject using a unit study approach meaning you immerse yourself in a time period or subject and do it throughout all the subjects. Pros: Very fun and hands-on. Kids are making projects and making connections. My oldest son LOVED this program. 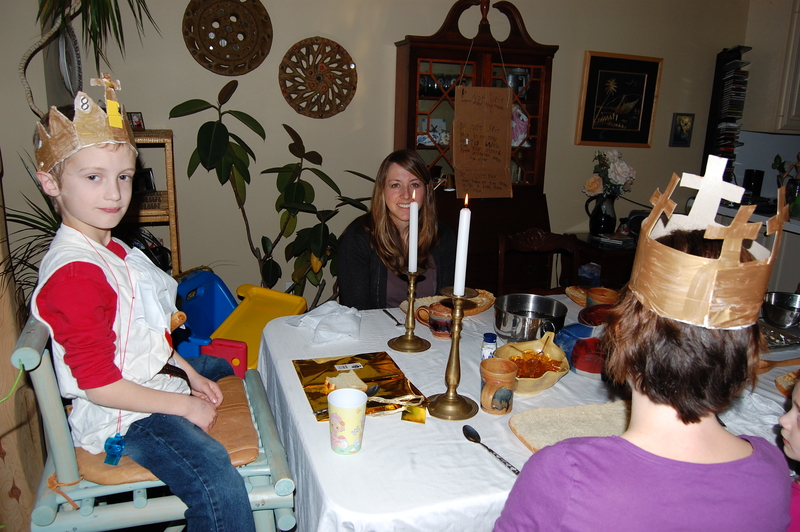 We did a Kings and Queens study that ended with a big round table feast that he completely put together. For 5 weeks we worked on it – what they ate back then, nursery rhymes that were written then, we read books about medieval time period, we wrote about king Arthur and King David, we learned what it meant to be a knight and wrote out the process. We learned about the castles (even built one using household items) and what the names of the different parts and how important each part was in fighting off invasions. 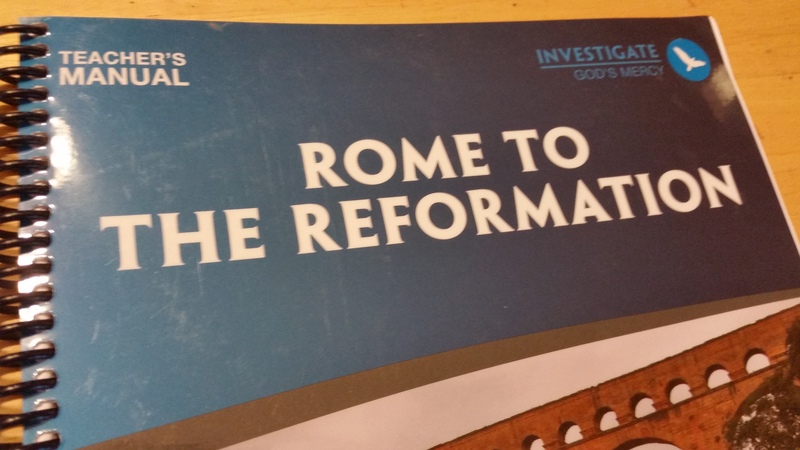 Very hands on, immerse yourself in a subject – FUN! Cons: Messy. Hard to organize. Projects take over. Hard to know when to stop. History also doesn’t go in order. They do offer a timeline to help the student see it all put together. It also wore me out. My recommendation? Do 1 or 2 unit studies a year nestled in with something else like Abeka or Bob Jones to make it fun, but I don’t recommend it being your full curriculum. MFW is a unit study approach put to chronological history cycles and allows you to teach multiple ages at one time. Whereas the 5 in a row and KONOS provide a base for you to add on to, this one is a whole kit. 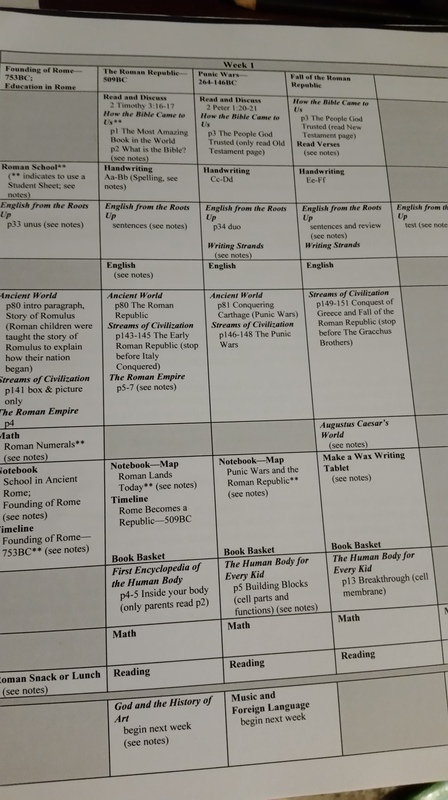 You do purchase your own math, spelling and language arts program, but they already have the time slots plugged into the daily schedule and they give you their recommendations. Pros: They cover every subject. Teacher manual serves as a guide without holding your hand with heavy scripts for every lesson. They give you great fun ideas to tie into the lessons. They include bible reading, missionary stories and provide both fiction and non-fiction literature to go along with where you are in history. 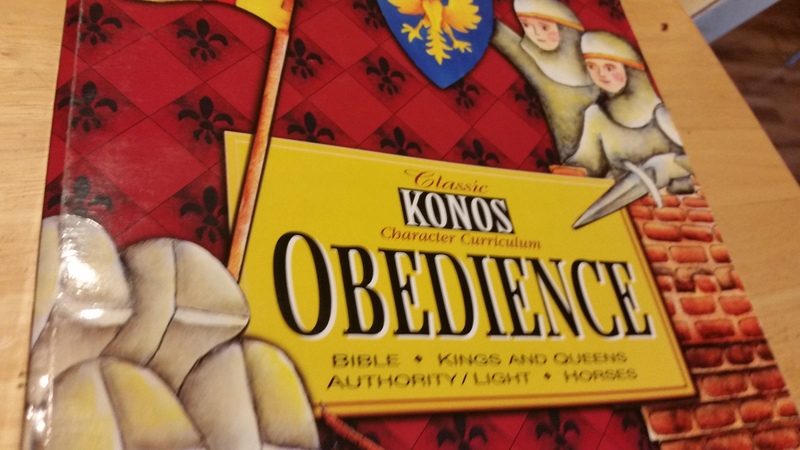 The history chunks are US history for 2-3 graders, Exploring Countries and Cultures (geography), Ancient times, Rome to Reformation, and so you go slow enough to grasp the concepts and not too fast to totally miss something. They also provide a synergy guide if you wanted to start your own co-op with other families using the same cycle. Cons: I found it hard to do every subject every day. So I had to modify that. Also, some of the suggested readers weren’t my favorite books. Could also be more challenging. But overall, this is my favorite boxed curriculum set. How do I define Charlotte Mason? Charlotte Mason was a British woman who lived during the late 1800s into the early 1900s. She worked hard to improve the quality of education. She believed heavily in treating children as people with individual interests, strengths, opinions and not reading “twaddle” to them as if they couldn’t understand higher level thinking. So the term Charlotte Mason curriculum is more a set of ideals and a philosophy of education rather than a box you order and follow the directions to. A Charlotte Mason education would consist of #1 rich, unabridged books, #2 no worksheets and end of chapter questions, #3 geared toward developing a heart of learning, #4 history through stories, science through animated animal characters and experiments, and exposure to the arts and handicrafts, #5 intentional focus on habits. Some books to consider if this style of education intrigues you: Charlotte Mason Companion, The Original Homeschooling Series, For the Children’s Sake. Also sites available that use her literature based approach include: Simply Charlotte Mason, Charlotte Mason Help, Ambleside. I have spent many hours reading and many days trying to apply several of these approaches and here’s my pros and cons conclusion. Pros: Rich literature based education with wonderful lively stories that put our family at the scenes of battles, feeling the heartbreak of war and struggles and feeling compassion for the people involved. Her approach of “oral narration” literally saved my homeschooling journey with my oldest child. I feared it wasn’t enough, but followed the process of what I read and his ability to follow and understand a story and then write a narration showed me it was enough. For the early years (K-3rd grade) I love the approach of copywork, the emphasis of a light structure, full of outside learning, exploring and being read rich literature. Their minds listen attentively when challenged with books from one of the above site’s book list. Cons: No teacher’s manual. Can be overwhelming at the mass of books to read in a year, especially with a struggling reader. Also, while I admire Charlotte Mason’s ideals and methods, sometimes they are not realistic to me, and I began to feel confined trying to implement them all. Ideally, Charlotte Mason learning means each child on a different year which means a different history cycle. This was no problem when I only taught one child, but 2 and then 3 children and history cycles, proved too much for me. Conclusion: Do-able? Absolutely! Just realize, perfection to her philosophy isn’t the goal, richly educating your children is, and that can be done by following what works, and throwing out what doesn’t…even if it’s in the teacher manual! Classical Conversations is a co-op rather than a curriculum that follows the Classical method of education. To know more about the Classical method, I will refer you to the books The Core, The Lost Tools of Learning, and The Well Trained Mind. Basically the Classical method is based on a word called the Trivium, which means there are three basic levels of learning: The Grammar, Dialectic and Rhetoric stage. In the Grammar Stage (generally ages birth to 9), you’re learning the basics, you’re seeing all the parts, understand how things tie in together. In the Dialectic stage (age 10-13) your breaking things down more and diagramming and parsing sentences, understanding why things are the way they are.The Rhetoric Stage ( ages 14-18) is about mastery and wisdom. Students use what they’ve learned and can now solve problems on their own. Pros: CC provides a great way to put pegs in the student’s mind of important information. Those pegs, later on will hold shirts and caps of much more knowledge, but without those pegs, the shirts and caps would just fall to the floor. While I love the book list of Charlotte Mason, I love the structure and memorization of CC. It provides a backbone that I fall back on when my school days aren’t what I wished they were. In class every week every subject is covered and a sentence in memorized. Subjects include history, science, timeline, Latin, math, geography, English grammar. Art and music are also covered. Every year students cover (in song) the entire timeline, beginning from Creation and go all the way to Sept 11. Again, it’s the peg analogy. Also I love that learning is done in a community. In the older, Challenge years, students explore serious life issues in a safe environment. Cons: My #1 con would be price. For home-schoolers, the tuition can seem steep, but compared to private school it’s nothing! But is the price worth it? Completely! Another con could be it’s a commitment. It is almost like the private school of homeschooling. If you’re looking for something like that, it’s perfect! If you’re more of an un-schooling, unscheduled home-schooler and you don’t want much structure, it’ll stretch ya! 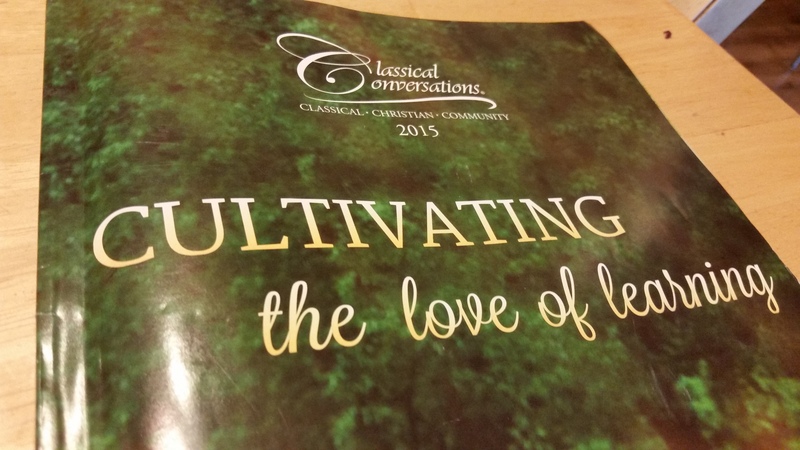 Overall, I highly recommend Classical Conversations! So, there you have it! My top feedback on the 6 curriculums I have tried. Have another curriculum you’d like my feedback on? Send it to me and I’ll do my best! Good stuff! I’m impressed with your in depth unit studies with Konos, but I know that’s NOT for me.. I agree, sounds tiring! I have not used Sonlight, only looked at their booklist, which looks wonderful! I don’t know how the teachers manual structures anything. Def know people who use and love it! Ah…i think about homeschooling…but know nothing about the curriculums! This is great, Julie, really love it. Hey Debra! Thanks, glad you liked the post. Anytime you have a question about homeschooling, just let me know!